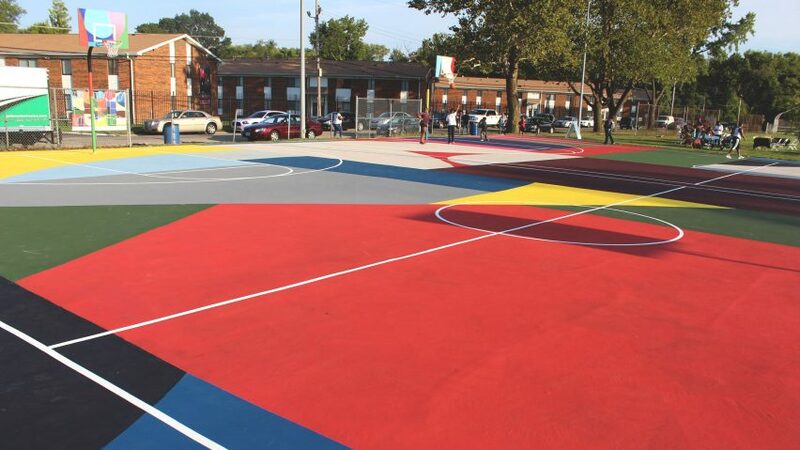 William LaChance spruces up St Louis basketball courts with "tapestry of colour"
Artist William LaChance has created a giant mural across a series of basketball courts in a St Louis suburb. The bold patterns are painted across three adjacent courts at the Missouri city's Kinloch Park, located close to the Ferguson area where riots broke out in 2014, following the shooting of a black teenager by a white police officer. LaChance partnered with non-profit organisation Project Backboard on the installation, with the aim to breathe new life into the area and encourage communities to come together through sport. "Kinloch, Missouri, was a very good location because it is historically significant," said LaChance, "but after years of poverty and corruption, is now on the brink of becoming a ghost town, so we hope that this project leads to more revitalisation." He also described the artwork as "the largest of its kind anywhere". 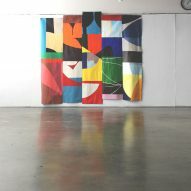 The colourful, geometric shapes are based on a set of five oil paintings, which the artist placed side by side to form a larger image. Combinations of curved and straight edges evoke the court markings, but do not coincide directly with them. The lines are painted in white over the top of the bold background, which includes hues of blue, green, red, yellow, brown and grey. "The primary intent of the design was to create not so much a cohesive, pictorial composition as it was to create tapestry of colour fields, large enough to act as stage sets awaiting the players," he said. Several urban basketball courts have been given colourful makeovers in recent years. In Paris, a court sandwiched between two buildings was transformed by Ill-Studio and Pigalle in 2015, then overhauled again with new shades earlier this year. Brooklyn-based artist Kaws also painted his signature motifs across two basketball courts in New York City in November 2016. 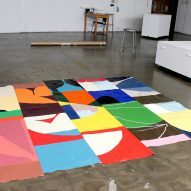 Photography is by William LaChance.